Winsor & Newton has many watercolour boxes. The toughest ones should be their heavyweight enamelled watercolour boxes. 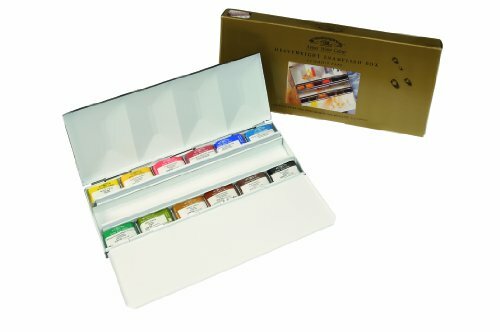 These boxes are expensive because they are sold with the Artist range watercolour pans. I've seen empty boxes being sold separately but the prices are very high as well. So it's more worth while to get the box together with the colours. 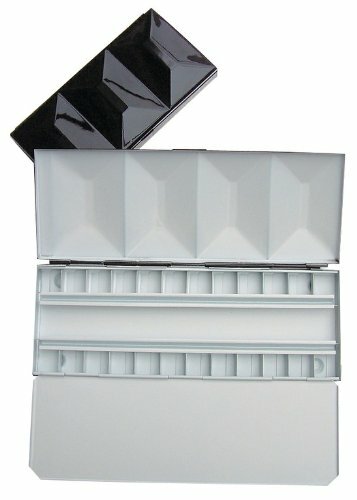 The watercolour boxes are sold in a variety of sets. In this review, I'll just compare the 12 full pan set, 16 half pan set and the 24 half pan set. 12 full pan and 24 pan set use a larger box than the 16 pan set. The half pan sets actually have dividers for each pans. That means you can only fit full pans in the middle row. The one I'm using is the 16 pan set which measures at 14.3 by 7.3 by 2.5cm. That's just slightly bigger than the plastic Sketcher's Pocket Box. I alternate that with the half-size Bijou box when I want something even smaller. My box has some black paint chipped off from the cover already. They open up to a few large colour mixing wells together with another flat palette. There are openings at the corners of the flat palette which are useful when you want to let water flow out during cleaning. The large colour mixing areas are very useful. In the space between the palettes, you can store brushes. The 16 pan box can fit a 14cm long brush. I use a collapsible brush in that place. You can also choose to pack even more pans into the boxes. The 16 half pan set actually has space for 24 half pans. And the 24 half pan set has space for 36 half pans! I like these boxes mainly because of the large mixing palettes. On average, it's about US$5 per half pan and it comes with a box so I would consider the overall value is quite high. I would recommend the 16 half pan box unless you require an even larger box. If you want a much smaller box, try the Bijou box. I've been using this box for a long time, parts of the paint are wearing off. You should be able to find these watercolour box sets at your local art stores. Search Jackson's Art Supplies (UK) also. I have one question about full pan set (12 colors, heavyweight one). Do you know if it's possible to fit additional colors (either half pans or full pans) in the middle? If yes, I should probably have to buy empty pans as well, to keep colors in place, right? Sorry for these questions, but I never used sets like this and there are no places in US where I can check it in store. The middle row is too big for the half or full pan sizes. You can fit 6 whole pans or 12 half pans in the middle of this box or a combination of these, for example I have five whole pans and two half pans in mine. You could either use pan paint or use empty plastic pans and fill with tube paint (which is what I did so my palette included my favourite tube paints too) If you do this let the paint dry a day or two before first use. As the space in the middle is bigger than the pans themselves if you just place them in there it wouldn't work as mentioned before. If however you do as I did, and use self adhesive magnetic tape bought on Ebay, cut it to size and stick to the bottom of each pan you will have secure paints that don't move around. I have heard of some people using those self adhesive 3D foam squares too. I hope this helps someone interested in this palette. It is lovely and weighty, feels expensive and is so practically designed. To protect the enamel being scratched I keep it in a drawstring bag when it's not in use (lessons on YouTube). I have the lightweight 24 pan one too which I hope to upgrade to the heavyweight version. In comparison it is very flimsy, the paint scratches off and is easily dented. The heavyweight box seems to be made of a material more conducive for mixing washes also. Great article by the way! Thanks for sharing. Those boxes are difficult to find. Hi Cindy, I spoken to the staff at Cornelissen and they said they enamel boxes is not exactly the same as the one Winsor and Newton uses. Why should there be dividers between the pans? Would it be possible to push a divider back so that 2 whole pans can be replaced for 3 half pans? I prefer to work with whole pans, but for some colours half pans will do. Yes, the dividers can be pushed down, but I'm not sure if they can be pushed all the way down. I've never tried. But it's better to get a box that already can fit those full pans.